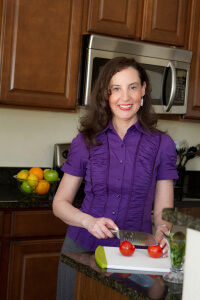 Debbie Polisky, MS, MBA, CLT is a Bilingual Nutritionist, Zumba Instructor, Wellness Consultant and Adjunct Faculty who uses mind and body techniques, such as mindfulness, stress management, exercise, dance/zumba, yoga and nutrition to improve the lives of patients, students and the community. She has over 20 years of experience in the healthcare field, in two countries, Argentina and in USA and in her two native languages, English and Spanish. “I enjoy educating others to stay healthy, whether in my role as adjunct faculty, nutritionist, wellness consultant or Zumba instructor,” says Debbie, “I’m also passionate about creating and implementing health programs which is why I created Your Hungry Heart. She has over twenty years of experience offering bilingual individual nutrition counseling and workshops in English and Spanish. “Finding a balance between work and play is important to our health,” states Debbie. She is passionate about dance (Zumba) and music (at this moment she plays her organ). She also enjoys swimming and yoga. Debbie has been writing her whole life, alternating science based articles with creative short stories or short ebooks. She loves to travel and learn about new cultures and food.